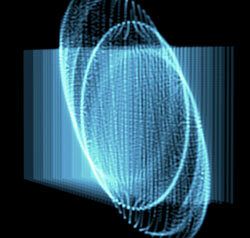 Spherical Field is used to push particles toward or away from a spherical volume. This group of controls is useful for shaping the form and integrating it with other graphic elements. 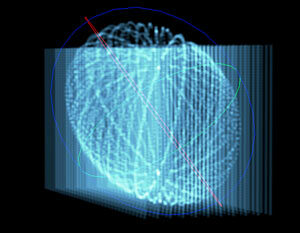 For example, Spherical Field can be used to push particles away from an area where a logo is placed. 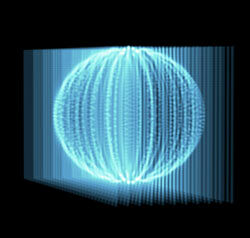 There are two Sphere fields and they are processed in order: Sphere 1 first, and then Sphere 2. Strength: Defines the power of the field. Strength is the directional displacement amount which the sphere pushes the particles around, which makes it an important control. When set to a positive value, Strength creates a field that pushes particles outward and away from the spherical form. 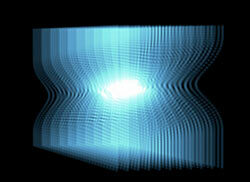 When set to a negative value, Strength pulls particles toward the center. Negative attracts, positive repels. Left to right, Strength at 0, positive value, negative value. Position XY, Position Z: Positions the center of the sphere in 3D space along the X, Y and Z axes. 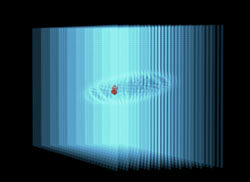 Radius: Defines the size of the Spherical Field for the X, Y and Z planes together. Higher values make a larger field. At left, Radius at 30, Strength at 30. In middle, Radius at 160, Strength at 30. At right, Radius at 160, Strength at -30. Scale X, Scale Y, Scale Z: Scales the diameter of the field on the X plane, Y plane or Z plane. Higher values make the plane larger. 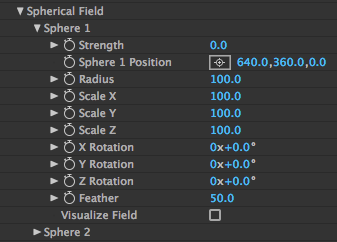 By default, all Scale values are set to 100, which creates a sphere. By setting different values for Scale X, Scale Y and Scale Z, you can push a spherical field with any kind of elliptical shape. At left, Scale X at 100, Scale Y at 100, Scale Z at 100. At right, Scale X at 230, Scale Y at 200, Scale Z at 50. X Rotation, Y Rotation, Z Rotation: Rotates the elliptical shape in the X direction, Y direction, and Z direction. 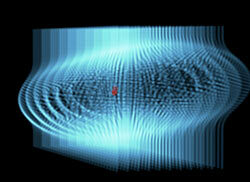 Feather: Defines the softness of the edges of the Spherical Field. This feathers the strength of how far the field gets pushed out (or in). Higher values make a softer field. Visualize Field checkbox: When this checkbox is turned on, a visual representation of the field is displayed. X plane is in red, Y plane is in blue, Z plane is in green. Turned off by default.